Status: WSL JQS 1,000 rated events for U18 Boys & Girls, SAST events for U16 & U14 Boys & Girls, and U12 Boys & Girls. Dates: September 28 – 30. 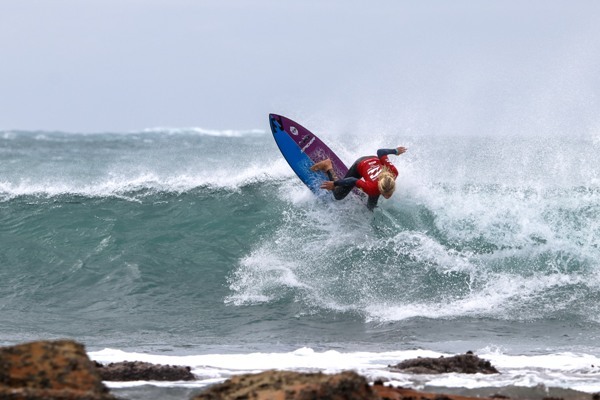 Seal Point, Cape St Francis – Excellent one metre waves with offshore conditions greeted the surfers on day 2 of the Billabong Junior Series Finale pres. by BOS, and the Pro Junior (U18) divisions were sent straight out in the early morning light. It was high action from the get-go, and Bryce Du Preez and Calvin Goor were the Men’s standouts along with Ceara Knight and Zoe Steyn in the Women’s division. Steyn was awarded a 9,33 out of a possible 10 points for her best ride, in which she executed a series of radical turns along the inside, ending up on the rocks. In the U14 Boys James Ribbink dominated his heat and although it was a bit wave-starved he banked two good scores for the heat win. Ribbink advanced along with Connor Slijpen. Other surfers who shone in this division were Christian Venter, an on-form Daniel Emslie and Brad Scott. Ribbink went on to win his semi-final and will compete in Sunday’s U14 Boy’s Final. In the highly competitive U16 Boys division, Mitch Du Preez and York Van Jaarsveldt advanced to the Final, leaving Aya Gericke and Josh Daniel in their wake. The second Semifinal in this division was a close affair, with Tide-Lee Ireland winning ahead of Reilly Mare. Sam Bennie and Nathan Perris were both eliminated in the process. The U16 Girls division was a spirited affair with Zoe Steyn showing her skills to advance along with Kayla Nogueira in the first Semifinal heat. The inform Ceara Knight was the winner of the second Semifinal and marched on to the final with Caroline Brown. The Pro Junior Divisions took much of the action today, completing three rounds, all the way to the man-on-man Semifinals. Excellent surfing by the best U18 surfers in the country resulted in massive turns, innovative and polished routines and some huge scores along the route to the finals. When the spray settled at the end of the day’s surfing it was Max Elkington and Luke Slijpen set to duel it out tomorrow in the Men’s Pro Junior final, while in the Women’s Pro Junior division final, Kai Woolf will come up against the dynamic Zoe Steyn. The Billabong Junior Series is supported by BOS, VonZipper, Surfing South Africa and the World Surf League. Seal Point, Cape St Francis – A calm morning soon turned into a blustery day as Seal Point – the venue for the Billabong Junior Series Final pres. by BOS – felt the brunt of a passing cold front and was hit with rain and wind during the early morning. The rain soon stopped however, and the surfing continued unabated in the good point-break conditions. The surfing kicked off with the U16 Boys, and stand-outs included Josh Daniel and Brett Taylor as well as Manoa Robb and Nathan Perris, with Robb the highest scorer of this round. The U14 Boys were next in, and there was some great surfing in this competitive division, with young Leo Faclier the stand-out with an excellent heat total of 13.17 (out of a possible 20 points). Other surfers excelling in this division were Luke Van Wyk, Connor Slijpen and Nate Colby. In the U12 Girls Semifinals, Anastasia Venter and Meka Loots, along with Sarah Scott and Gabi Herbst, all surfed excellently to advance through to the finals in their division, while in the U14 Girls it was Aimee Du Preez and Kaylee Shaw Nell who advanced to their respective final, along with Adriel Wolmarans and Olivia Winter. By the time the WSL Africa junior men’s event took to the water, the surf had improved considerably, and there were several great performances by the best 18-and-under surfers in the country. York Van Jaarsveldt put on an excellent opening heat performance, winning his heat and advancing along with Karl Steen. Both surfers were on form and surfed with style and maturity. Aya Gericke advanced along with Brad Scott in the second heat, and Bryce Du Preez and Thomas Lindhorst emerged successfully from their encounter, eliminating Daniel Orpen and James Ribbink in the process. The final heat of Round 1 was won by Luke Thompson whose surfing showed a maturity beyond his years. Along with rising young East London star Daniel Emslie, the pair eliminated Samuel Loppnow and Manoa Robb from the event. The opening heat of the WSL Junior women’s JQS 1,000 rated event saw Ceara Knight beat runaway rankings leader and event favourite Kai Woolf with fast and dynamic surfing as both girls advanced into the next round. Kayla Nogueira also won her opening encounter, taking heat runner-up Kirsty McGillivray along with her to the next round. Zoe Steyn put on a polished performance on her backhand to win her heat, and advanced along with Tayla De Coning, while Aimee Du Preez and Olivia Izzard survived their encounter and will be back in the water first thing tomorrow morning. The forecast for Saturday looks promising, and the event organisers have their sights set on an early start. A slight lift in the swell, less wind and an afternoon high-tide could all come together for an amazing day of surfing. Seal Point, Cape St Francis – The best junior surfers in the country are arriving in Seal Point for the final event in the 2018 Billabong Junior Series. The surf forecast for the contest has signs that it might be an epic weekend of surfing at the ever-consistent Seal Point, with plenty of swell around for the competitors to display their top surfing skills to the judges. This event is possibly one of the most crucial junior surfing tournaments of the year, with much at stake for the competitors. Firstly there are the stand-alone event results, with surfers wanting to win this contest for points and prize money. Leading on from this, there are the Billabong Junior Series winners. 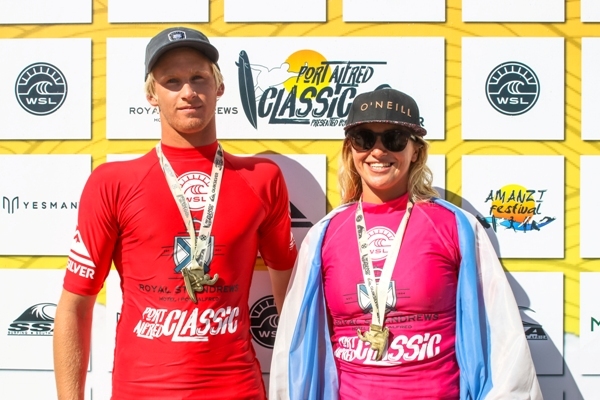 Two event results count for these winners – from both the Billabong Junior Series Ballito and Seal Point events. This event will also crown the World Surf League (WSL) Africa Junior champions, which will also lead on to the qualification for the WSL World Junior Championships, including the top four men and top two women surfers who will compete in the World Junior Championships in Taiwan in December 2018. It promises to be an action-packed and dramatic weekend of surfing. The WSL Africa Men’s Junior Tour is currently being led by Luke Slijpen, with Eli Beukes and Max Elkington hot on his heels, and Dillon Hendricks and Bryce Du Preez not far behind. Slijpen has had an excellent competitive year and has a healthy lead in this division, with Beukes more than one thousand points behind him. In the WSL Africa Women’s Junior Tour rankings, Kai Woolf is out in front with a comfortable lead over second ranked Zoe Steyn, with Sophie Bell in third place going in to this event. Kirsty McGillivray and Kayla Nogueira make up the remainder of the top five positions. Both divisions contain a number of surfers who have improved dramatically over the last year, and there is every possibility of an upset in either division from the likes of Karl Steen and Daniel Emslie in the men’s, and Ceara Knight and Sne Makhubu in the women’s divisions respectively, to name a few. In the U16 Boys division, all eyes will be on Tide Lee Ireland, York Van Jaarsveldt and Mitch du Preez, while in the U16 Girls division Zoe Steyn, Kayla Nogueira and Gabi Lailvaux are just three surfers who look set to dominate. The Billabong Junior Series runs from Friday to Sunday when all the event and series champions will crowned at the awards ceremony on the beach. Dale Staples (St Francis Bay) and Luke Thompson (Durban) earned their maiden World Surf League (WSL) event titles when they won the Men’s and Junior Men’s respectively at the Mitchum Buffalo City Surf Pro pres. by Reef Wetsuits in East London on Sunday. Classic conditions and a pumping 1.5 to 2.0 metre swell at Nahoon Reef produced the ideal canvas for the country’s top surfers to perform their magic in the Qualifying Series (QS)1,000 rated men’s and Junior Qualifying Series (JQS)1,000 rated events. After having to wait out a lull in the waves that saw the Men’s final restarted after no rides were had in the first 10 minutes, Staples raced into a commanding lead in the final, tearing his first wave apart and being rewarded with an excellent 8.50 out of 10 from the judges, before adding a 7.0 minutes later. His opponent Matt McGillivray (Jeffreys Bay), currently the highest ranked South African in 10th place on the QS leaderboard, was left needing a massive 15.50 points before he had even caught a wave. Uncharacteristically McGillivray fell victim to a priority interference error that penalised him the full score of one of his two counting rides and effectively banished him to the runner-up spot. Staples eventually ran out the winner by 15.50 vs. 5.00 to claim his first WSL event title and, even though he claims that he is no longer a full-time competitive surfer, he has moved into the top 5 on the WSL Africa rankings list with his victory. The semi-finals saw Staples have the rare privilege of ousting East London surfing legend Greg Emslie in his home break while McGillivray dug deep and produced and epic ride that earned him the event’s highest score – a near-perfect 9.25 – to overtake Diran Zakarian (Melkbosstrand) in the dying minutes of their last four encounter. The Junior Men’s final showed that local surfing is in good hands when the four finalists all went ballistic in the pumping overhead surf and the lead changing hands after virtually every wave. When the siren sounded to end the final Luke Thompson from the Durban beachfront was leading by a slender 0.60 of a point over local favourite Thomas Lindhorst (East London). Luke Slijpen (Hout Bay) made a determined effort for victory with a great last ride, but had to settle for third place, 0.75 of a point behind Lindhorst, while East Londoner Mitch du Preez claimed fourth place. Alongside the red hot surfing action, Surfing South Africa, the national controlling body for the sport, ran activities coordinated by SSA Development Officer, Danielle Powis, designed to foster and encourage surfing among young people, regardless of their background. Full results, photos and video footage will be available on www.WorldSurfLeague.com and on the WSL App. The top rated competitors in the Mitchum Buffalo City Surf Pro pres. 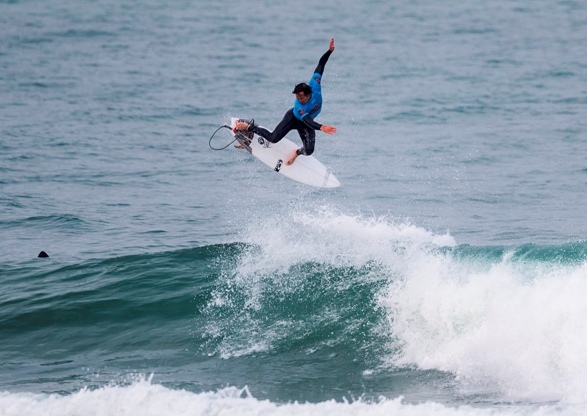 by Reef Wetsuits justified their seeding by advancing to the next round on Day 1 of the World Surf League (WSL) Qualifying Series (QS) event taking place at Nahoon Reef in East London. The top four seeds – Beyrick de Vries (uMhlanga), David van Zyl (Glenashley) and the Jeffreys Bay pair of Matt McGillivray and Dylan Lightfoot all posted comfortable heat wins. Lightfoot was the standout of the quartet, hunting down four great waves and utilising his trademark high performance repertoire to earn the day’s highest heat total of 15.40 out of 20. Local and national surfing legend Greg Emslie (East London) showed his knowledge of Nahoon Reef, the break that he honed his skills on, by delivering an excellent 8.0 ride and a heat tally of 13.75. But it was Diran Zakarian (Melkbosstrand) who earned the highest single ride score, an outstanding 8.50, as he cruised into Round Two alongside heat runner-up Chris Leppan. History was made when Jean Patrice Furcy became the first Mauritian surfer to compete in a WSL event. Thanks to the tireless efforts of WSL Africa Operations Manager, Colin Fitch, Furcy will be spending three months in South African competing in the local events. He was presented with two brand new surfboards by Hurricane Surf when he arrived at the event site this morning. There were upsets in the women’s event when Kayla Nogueira (uMhlang) and Danielle Powis (Muizenberg) were eliminated in the first round, but Kirsty McGillivray (Jeffreys Bay) and Olivia izzard (La Lucia) restored order by progressing to meet the top eight seeds in Round 2. Kai Woolf (Jeffreys Bay), winner of both the women’s and junior women’s event in Port Elizabeth over Easter, and Summer Sutton (Kommetjie) took the honours in the opening heats of the junior women’s heats on Day 1. Saturday’s schedule will see both the women’s and junior women’s events concluded with the winners crowned at the event site at the end of the day’s proceedings. Organisers will meet at East Beach at 7.00 am local time on Saturday to make a call on when to get the contest underway, with an 8 am start anticipated. Kai Woolf of Jeffreys Bay was the standout performer in the Volkswagen Nelson Mandela Bay Surf Pro pres. 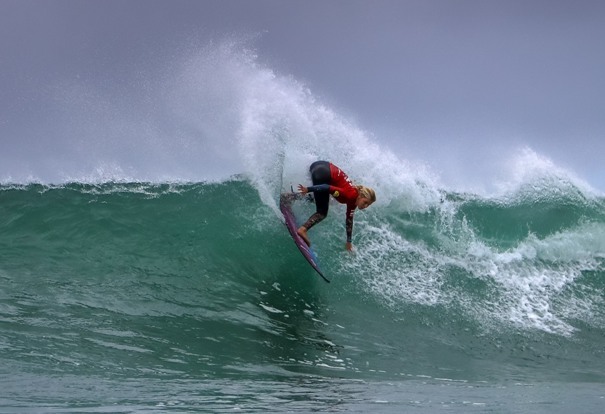 by Billabong in Port Elizabeth over the Easter weekend, clinching both the women’s and junior women’s titles while David van Zyl (Glenashley) won the men’s event and Dillon Hendricks, also from Jeffreys Bay, captured the junior men’s crown. 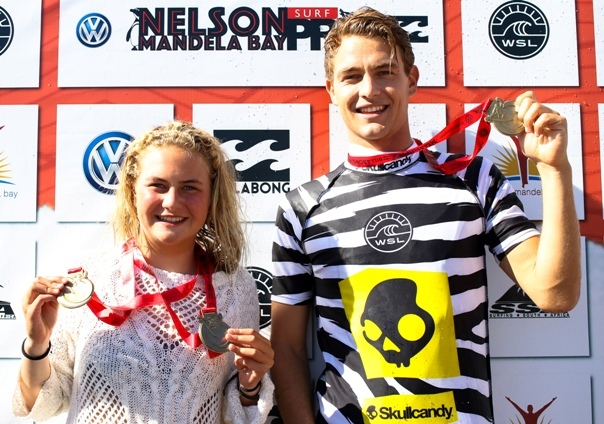 The first of 13 events on the 2018 World Surf League (WSL) Africa regional tour, the Volkswagen Nelson Mandela Bay Surf Pro featured Qualifying Series (QS) events for men and women alongside Junior Qualifying Series (JQS) events for men and women aged 18-and-under. Woolf, 16, was unbeatable in the beach break conditions, winning every heat she contested in both events while racking up double digit heat scores with her impressive repertoire of high performance manoeuvres. In the QS 1,000 women’s event, the teenager defeated reigning WSL Africa champion Nicole Pallet (La Lucia) in the one-on-one final, catching two waves early in the final and delivering scores of 6.25 and 7.25 (each out of 10). A howling SW ‘wind that sprang up midway through the heat altered the lineup significantly and Pallet was left the near impossible task of finding an excellent 8.50 in the deteriorating conditions. Earlier Woolf was equally dominating in the four-person JQS 1,000 women’s final. She again posted her best scores early in the encounter to leave Sophie Bell (Salt Rock), the 2017 WSL Africa junior women’s champ, requiring a solid 7.0 when the siren sounded to end the heat. Anna Jellema-Butler (Cape Town) and Olivia Izzard (La Lucia) took third and fourth places respectively. Van Zyl justified his top seeding for the QS 1,500 men’s event in PE and was in a class of his own, averaging heat scores of 13.56 (out of 20) during his first event of the year. Ranked No. 67 on the QS at the end of 2017, and No. 2 on the WSL Africa leaderboard, van Zyl narrowly overcame Dylan Lightfoot (Jeffreys Bay) in their quarter-final duel and posted an outstanding 8.75 to pip Jordy Maree (Kalk Bay) in their semi clash. In the final van Zyl opened his account against Adin Masencamp (Strand) with a well ridden 7.50 and surfed with power and flow to consistently add to his total in the testing conditions. He earned three scores in the six-point range before a 7.0 closed the door on his opponent hopes and saw van Zyl pocket the R40,000 winner’s cheque and 1,500 precious ranking points. Masencamp, in his rookie season in the open ranks following a stellar junior career, had a confidence-boosting run in the event, but could not match van Zyl’s finesse in the final. The 18-year-old from the Strand defeated Australian Ty Watson in the quarters and then 2017 Ballito Pro Trials winner Richard Kidd (Ballito) in the semis to set up his first man-on-man QS final in South Africa. Hendricks, 17, came into the event seeded outside the top 10 but cut a path through his more fancied opponents to earn his first JQS title. He outpointed Daniel Emslie (East London) and Luke Slijpen (Hout Bay) this morning to reach the final where he relegated multiple event winner Max Elkington (Kommetjie) to the runner-up spot by the narrowest of margins. Both surfers scored heat totals of 13.50 out of 20, but Hendricks got the nod thanks to a highest single score of 7.75, which he earned on a mid break wave where he belted the lip multiple times. Elkington’s best of 7.50 was enough to see finish ahead of Koby Oberholzer (Warner Beach) and Bryce du Preez (East London) who had to settle for third and fourth places respectively. The Volkswagen Nelson Mandela Bay Surf Pro, which is also the first of five events on the 2018 City Surf Series (see schedule below), enjoyed great conditions for Saturday and Sunday before experiencing four seasons in eight hours on the final day. Alongside the red hot surfing action, Surfing South Africa, the national controlling body for the sport, ran activities coordinated by SSA Development Officer, Danielle Powis, designed to foster and encourage surfing among young people, regardless of their background. Other onsite activities included a kids’ “Trash to Treasure” craft section, a group Clean-the-Beach activity and a plastic awareness talk (see more below). Volkswagen South Africa was proud to bring surfing fans the first event in the 2018 City Surf Series; the Volkswagen Nelson Mandela Bay Surf Pro presented by Billabong, as well as the final event in the series, the Volkswagen SA Open of Surfing, coming back to Port Elizabeth in June. Volkswagen South Africa’s remains committed to the City Surf Series first and foremost because of their passion to help drive local surfing and surfers forward. The ‘People’s Car’, with a long-standing history in the surfing culture believe in the opportunity the series presents to local surfers; giving them the chance to score accredited World Surfing League (WSL) Qualifying Series (QS) points, the log that leads to a spot on the WSL’s Championship Tour. Amidst cheering on local surfers and displaying the best in surf ready vehicles – such as the Volkswagen California Beach camper van, Caravelle and Transporter Crew Bus – Volkswagen was also out to drive a critical ocean awareness message. Together with their longstanding partners, the Dyer Island Conservation Trust (DICT), Volkswagen South Africa set up a giant Recycled Plastic Surf Wave for spectators to pose with to highlight the ocean’s plastic waste crisis. Other activities included a kids’ “Trash to Treasure” craft section, a group Clean-the-Beach activity and a plastic awareness talk at the Learn to Surf Initiative with Surfing South Africa.